On February 23, 2018, Shinzo Abe, Prime Minister of Japan, held a summit meeting with H.E. Ms. Michelle Bachelet Jeria, President of the Republic of Chile, who was making an official working visit to Japan. Prime Minister Abe mentioned that various exchanges took place last year, which marked the 120th anniversary of the establishment of Japan-Chile diplomatic relations, including the visit to Chile by Their Imperial Highnesses Prince and Princess Akishino, and activities by Chile’s Nikkei community. Prime Minister Abe noted that by elevating the relationship between Japan and Chile to a “strategic partnership,” he intends to further deepen cooperation between the two countries and in the international arena through fora such as “policy dialogues” for discussing the bilateral relationship and various challenges in the international arena. Furthermore, Prime Minister Abe stated that Japan is scheduled to dispatch a defense attaché to Chile from 2019, and expressed expectation that a cooperative relationship will be promoted in the defense field. In addition, with regard to the economic field, the two leaders welcomed further progress with the two countries’ economic relationship through the building of economic frameworks, including the Japan-Chile Economic Partnership (EPA) that entered into force in 2007 and the tax convention that took effect in 2016. Prime Minister Abe mentioned the successful progress being made with the KIZUNA Projecti, a cooperative project in the disaster reduction field, and stated that the target for the number of people to be trained by 2020 will be doubled from 2,000 to more than 4,000. In addition, the two leaders also welcomed that the Japan-Chile Partnership Program (JCPP)ii 2030, a memorandum on trilateral cooperation, is now set to be signed. 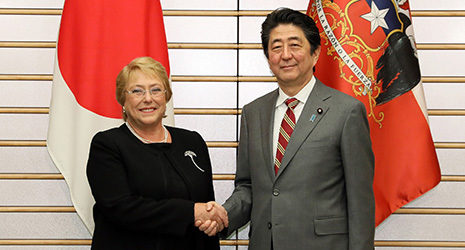 In response, President Bachelet introduced activities relating to the 120th anniversary of the establishment of diplomatic relations between the two countries, and stated that she intends to further advance cooperation in the defense field and the trade and investment field, as well as trilateral cooperation between Japan and Chile, including in the disaster reduction field. Furthermore, President Bachelet expressed gratitude for Japan’s support at the time of the forest fires in Chile in 2017, along with stating that she hopes to cooperate to realize the United Nations’ 2030 Agenda for Sustainable Development. In addition, the two leaders welcomed that a working holiday scheme will begin operating on February 23, that a memorandum of cooperation in the sports field is now set to be signed, and that a substantial agreement was reached on an agreement concerning driver’s licenses, and shared the view that they will advance exchanges between citizens in a variety of fields. With regard to cooperating on regional affairs, including the North Korea issue, and in the international arena, including UN Security Council reform, the two leaders shared the view that the cooperative relationship will be deepened. In addition, the two leaders confirmed cooperation in the run-up to the Asia-Pacific Economic Cooperation (APEC) meeting that will be held in Chile in 2019. Furthermore, as Japan and Chile are both maritime nations, the two leaders discussed the importance of a free and open maritime order. In addition, Prime Minister Abe explained the “Free and Open Indo-Pacific Strategy,” and the two leaders shared the view that they will continue the discussion. With regard to the North Korea issue, Prime Minister Abe explained that it is necessary to maximize pressure on North Korea, and he also expressed expectation of understanding and cooperation for promptly resolving the abductions issue. In response, President Bachelet mentioned that she will visit Nagasaki during her stay in Japan, explained that Chile has a firm position that is opposed to proliferation and to North Korea’s nuclear development program, and has consistently cooperated with Japan. The two leaders shared the view that they will coordinate closely. i Officially known as the “Disaster Risk Reduction Training Program for Latin America and the Caribbean in Chile” (March 2015-March 2020), a technical cooperation project. The project trains personnel for contributing to disaster prevention in countries in Latin America and the Caribbean through trilateral cooperation that includes dispatching specialists from Japan to hold disaster prevention training in Chile. A target of training 4,000 people during the five-year cooperation period has been set. ii Japan and Chile work together on cooperation with other developing countries (so-called trilateral cooperation). An agreement document was concluded in June 1999. Thus far, third-country training and specialist dispatches to third countries have been implemented in fields such as disaster prevention and the environment, fisheries and medical care.